F This Movie! : F This Movie! - That Thing You Do! F This Movie! - That Thing You Do! Patrick and guest host Erich Asperschlager are smitten with '60s pop music, magical black men and Liv Tyler as they discuss 1996's That Thing You Do!, written and directed by Tom Hanks. 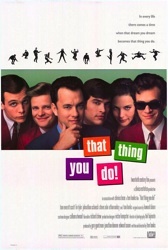 "THAT THING YOU DO" was the PERFECT FILM of the year 1996. Tom Hanks directs, writes and stars in this brilliant rock 'n' roll movie, which features a great soundtrack too.